The Box of Delights arrived yesterday morning, which witnessed a hard frost in the valley and a beautiful winter sky. I noted, last weekend, that the DVD cover art alluded to The Lord of the Rings. The connection doesn't end there because Robert Stephens played Aragorn in BBC Radio 4's critically-acclaimed adaptation of The Lord of the Rings (a touchstone in audio dramatisation). 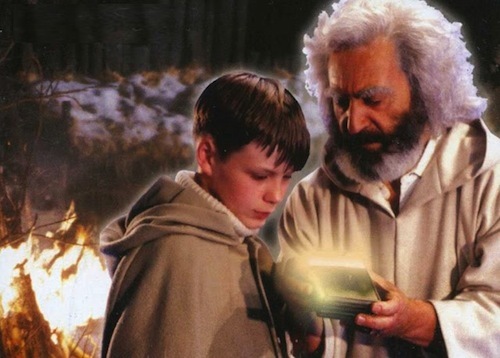 The Box of Delights, aside from inherent special effects limitations and a propensity for overlit scenes shot on video, has not lost any of its dramatic power and showcases an enviable cast. Patrick Troughton, famous for his 'cosmic hobo' portrayal of the Second Doctor, excels as the enigmatic Cole Hawkins. The main theme (The First Noël interpolated) is as haunting as I recall in childhood - a flurry of unimaginable wonder tinged with sadness. The adventures of Kay Harker compares favourably with any featuring Harry Potter, Frodo and Luke Skywalker.